Muslims | Jews Say No: Not In Our Name! 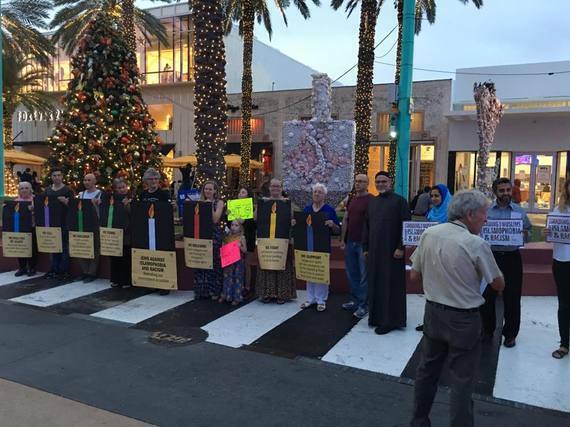 4/28/15 Jews Against Islamophobia Coalition stands strongly in opposition to Islamophobia in all its manifestations. Most recently, the courts ruled that Pamela Geller has the right to put up her virulently anti-Muslim ads on public buses. As a community, we will make our voices heard as forcefully as we can in protest of Islamophobic hate speech. “The minute I read Geller’s language for the ads,* I was reminded of the history of accusations of blood libel against the Jewish community that provoked, and fed into, anti-Semitism,” said Marjorie Dove Kent, executive director, Jews for Racial and Economic Justice. Geller is the lead instigator and public face of a nationwide anti-Muslim ad campaign. She co-founded, with Robert Spencer, three groups designated as anti-Muslim hate groups by the Southern Poverty Law Center. The American Freedom Defense Initiative (AFDI), one of these groups, is the sponsor of the ads. Geller’s ad campaigns most often explicitly link Israel with Islamophobia through images and words that smear Muslims and Palestinians. These campaigns have engendered bold and creative opposition by a wide range of communities—and this time will be no different. *The ad reads: Killing Jews is Worship that draws us close to Allah. Jews Against Islamophobia can be reached at jewsagainstislamophobia@gmail.com.